What can I say, this place is amazing!! What a beautiful treasure! 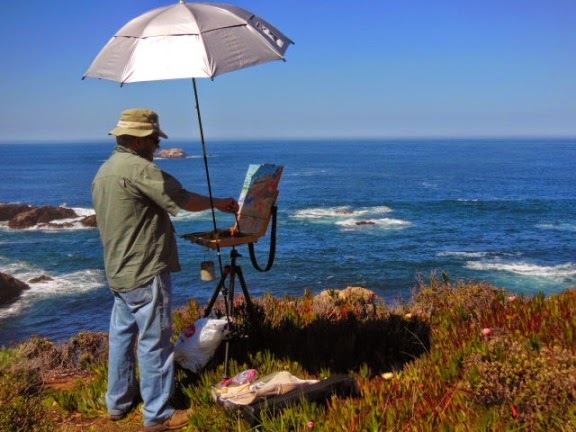 So thankful for the opportunity to paint at Point Lobos! If you plan to go there (don't miss it!) I'll relate our experience getting in. First, go early in the day!! When we got there around noonish they were only letting a car enter when one left the park. After we got in I wanted to go to Whalers Cove first. The road leading to the parking lot was blocked by a sign that said the parking was full. I drove around the sign and the parking lot had several empty spots. Just sayin... Here's another video of my initial reaction.. Mean while back at the convention there was more great demonstrations and good times talking with fellow artists. 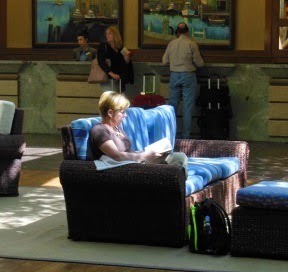 Ann, being the great painting companion that she is, relaxed in the beautiful foyer of the Portola Hotel waiting for me to get going. 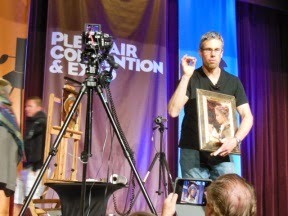 Daniel Gerhartz gave a great portrait demo and also did some plein air painting on location with the other artists. It was a real treat to watch him work! I was excited about our next location because I have never been to Carmel. Well into the process someone stopped and asked, if I knew the car I was painting was a Tesla! ...Cool! 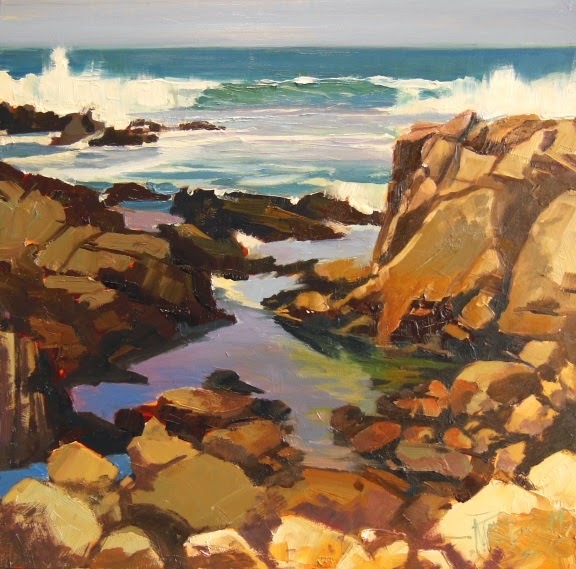 I did two paintings at Asilomar Beach. This was the second one. I left it pure plein air, no touch up in the studio. Quite often I will do some touch up depending on how much time I had to finish. There was more studio work on the first painting of the day (last post) even though I spent a lot more time on it. 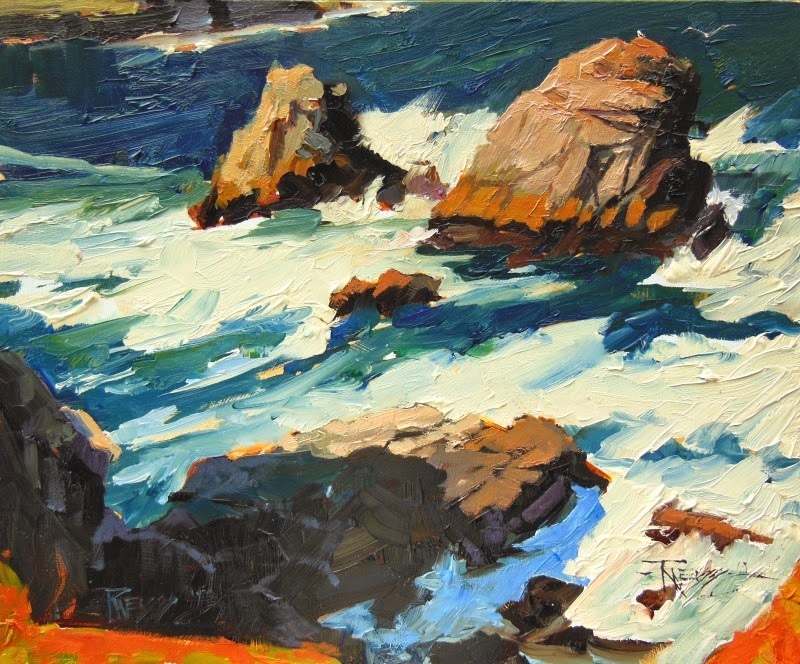 This one went fast and furious as I tried to convey the movement of the waves and the blusteriness of the day. After composing the painting I put more effort in conveying a feeling than accurately depicting detail. I would like to paint this way more! 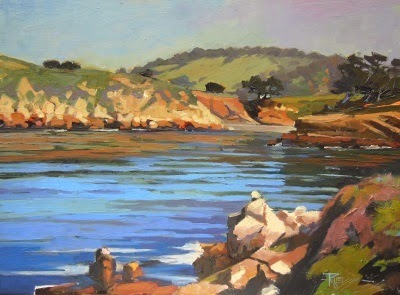 A lot went on at the plein air convention between painting times and I won't go into much of that. 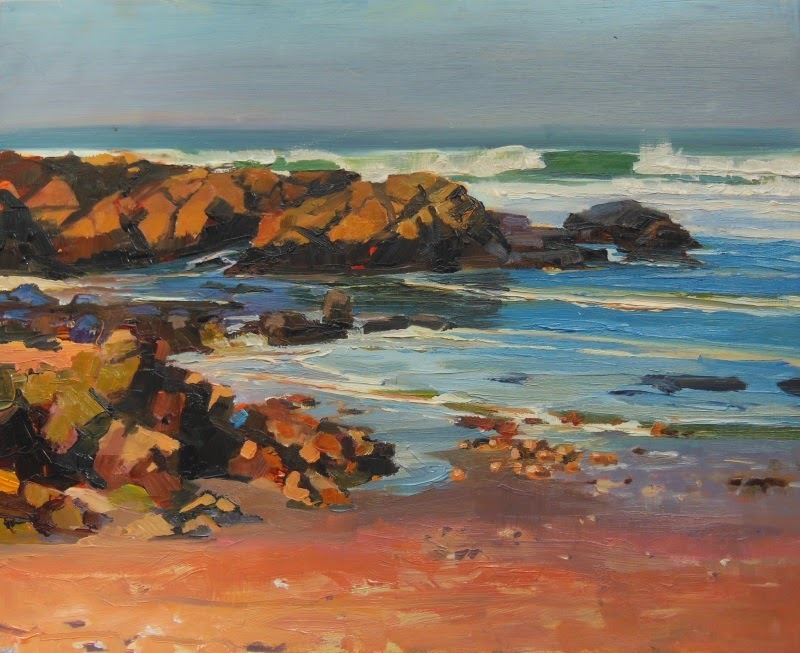 If you would like to know more you can subscribe to Plein Air Magazine's newsletter or the mag itself. It is one of the better magazines out there for artists and collectors. 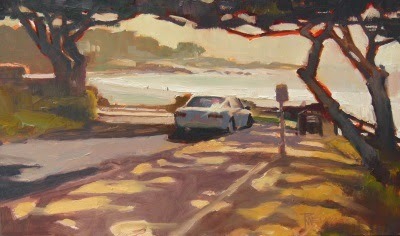 The next location we went to paint was Asilomar beach not too far from the hotel. Everyone told me it is a windy beach most of the time and this day was no exception. 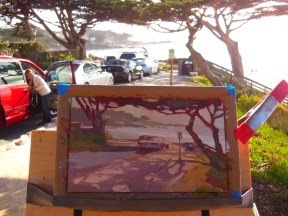 There were hundreds of artists on the beach painting but it seems I always pick a spot away from the congestion. I had trouble with the wind so you can see my solution in the video..
After finishing up at Garrapata State Park it was time for lunch and we met at the Rocky Point Resturant. A great spot to eat ...and to set up and paint after!.....In fact, the views are so spectacular if you are an artist or photographer you may skip lunch and just go to work! But that would be a mistake because the food is pretty good! An extra bonus in April is the migrating Gray Whales that are cruising up the coast to their summer feeding grounds in Alaska. 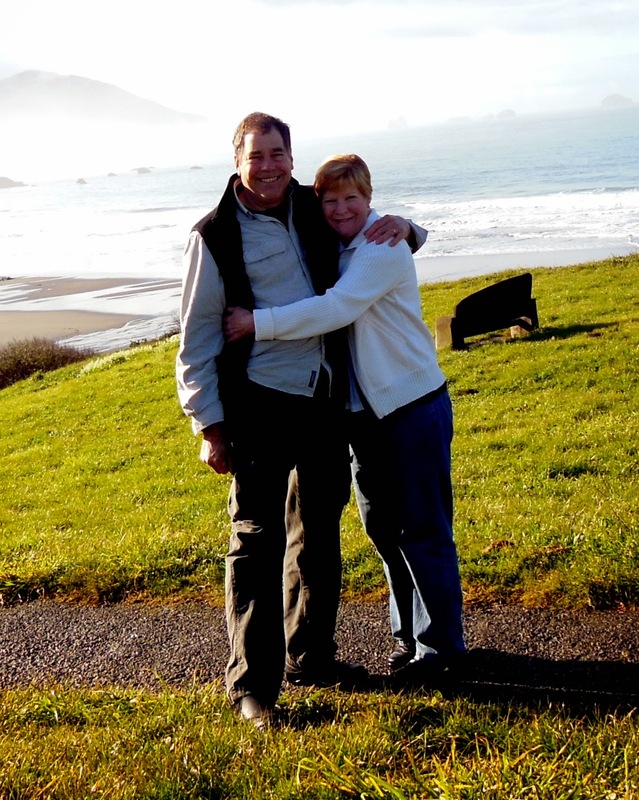 Needless to say I was blown away by the beauty of the California coast as Ann and I traveled south and the sun came out revealing the crystal turquois water of the pacific ocean near Monterey! 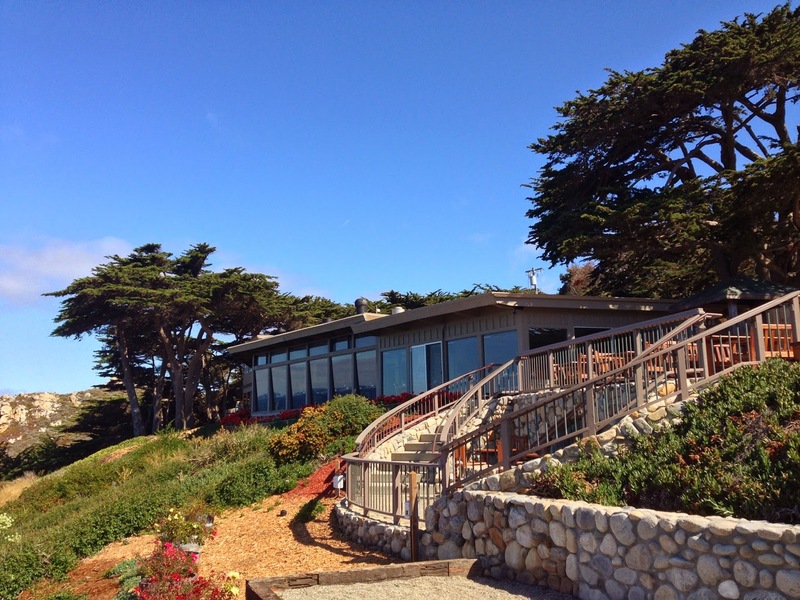 We stayed the first night at a motel in Monterey taking some time to drive thru Napa valley and visit galleries in Senoma. 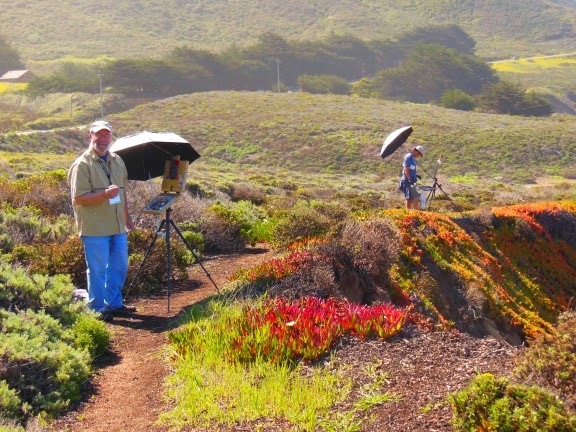 After we moved over to The Portola for the Plein Air Convention I quickly ran into a good friend I've known for years on the internet but have not met face to face, Mike Bailey. He is a fantastic watercolorist and we first met, cyberly speaking, when most artists shared their work and conversed on their blogs around 2006. He introduced me to some new friends, Mark Mahaffey and Scott Hamil and we all packed our pochade boxes and headed for Garrapata State Park. What a blast meeting and spending time painting with these great artists! 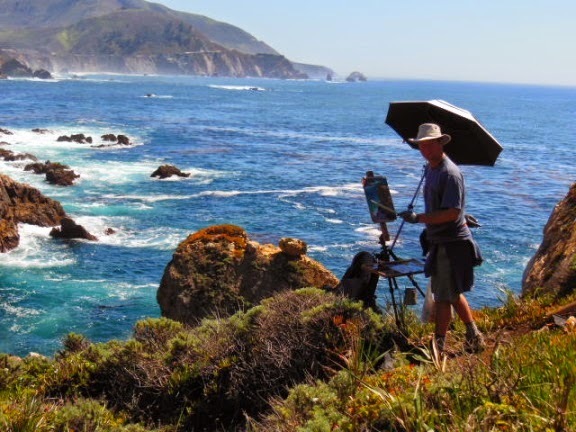 In early April, Ann and I left Washington state to attend the third annual Plein Air Convention in Monterey California. We were excited to leave 40 degrees and raining in Poulsbo to 80 degrees and sunshine in California....plus, we just always love a road trip! 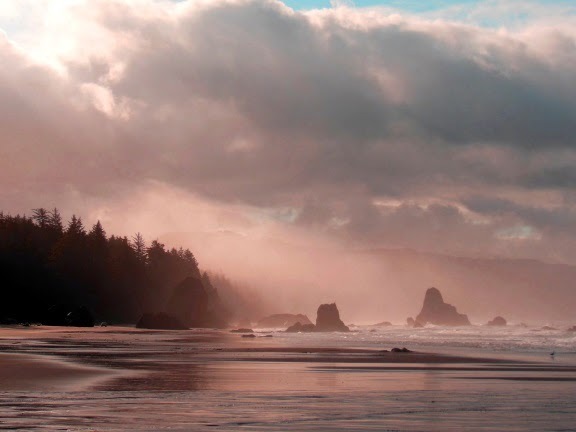 The drive through Washington state was just a rainy blur but when we crossed the Oregon border things started to shape up and the sun started to break through. 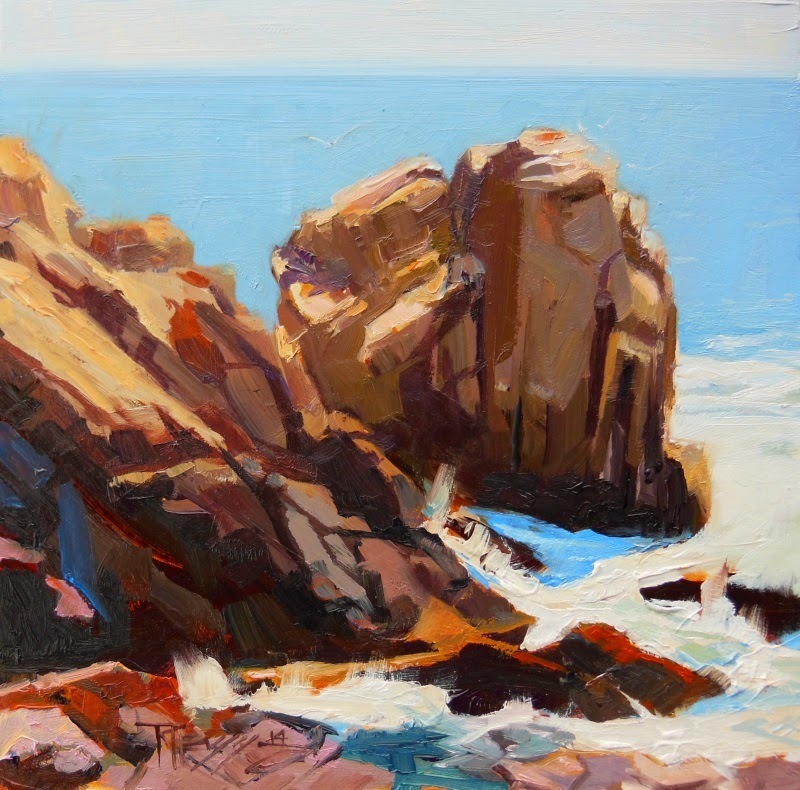 I didn't do my first painting (above) until we reached the California coast but we had some fun adventures along the way...and the sun did come out ..finally!